Influenza starts with a feeling of being really sick all over, mainly infects the respiratory organs, is highly contagious and prevalent in winter. There are 3 types of influenza A ,B and C. Recently, most seasonal outbreaks are caused by two of the following three subtypes: influenza A (Hong-Kong), influenza A, (USSR) and influenza B. Due to slight genetic mutations that occur almost annually, most people are susceptible to seasonal influenza. When major genetic mutations occur, new types of the influenza virus form. This can result in a global pandemic. The influenza virus is extremely contagious and since it prefers a cold, dry climate, it can spread very easily and rapidly among large groups of people during the winter. It has an incubation period of 1-2 days. Symptoms include the sudden onset of a high fever with chills which can last 3-5 days. Compared to a common cold, symptoms such as feeling really sick all over , joint pain, muscle aches, headaches, sickness and diarrhea, coughing, runny nose and sore throat are more severe. Medicines to relieve the cough and sputum as well as to bring down the fever will be prescribed. Starting antiviral medication within 48 hours of the onset of symptoms will help speed up your child’s recovery and the duration of the fever may be shortened by one to two days. Healthy children do not need antiviral treatment, since it may cause severe side effects. You should consult your doctor about their usage. If Tamiflu is taken within 48 hours of the fever starting, it can bring down the fever and alleviate influenza symptoms 1-2 days earlier. Recently it has been reported that one rare, but serious side effect of the medication may be an altered mental state and abnormal behavior. However, influenza itself may cause such symptoms. While it has not been established that Tamiflu causes dangerously abnormal behavior, such as jumping out of windows, prescribing the drug to children aged between 10 and 19 years has been restricted due to such reports. While Tamiflu can reduce the duration of the fewer and speed up the recovery of young children by several days, influenza itself is a natural self limiting disease, which will heal spontaneously in most healthy persons whether they take Tamiflu or not. Thus, parents should not worry about influenza symptoms becoming more severe if Tamiflu is not taken and there is no need to consult a doctor outside surgery hours just to have Tamifulu prescribed. 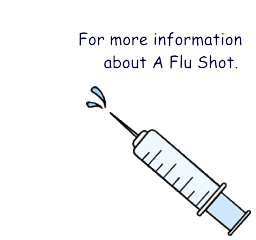 Influenza encephalitis usually starts within 24 to 48 hours of the onset of a fever, so before Tamiflu can take effect. Regardless of taking Tamiflu or not, children should not be left unsupervised when they have a fever due to influenza. Always watch them carefully. This medication is inhaled orally. Children aged over 5~6 years can inhale this medicine effectively. The incidence of abnormal behavior is less than that for Tamiflu. This medication should not be prescribed for asthma patients, since it may bring on an asthma attack. Relenza can be prescribed for patients aged 10~19 years. If your child does suffer some side effects, they may hallucinate, become violent or try to jump out of windows. ･Do not use medicines that contain aspirin to reduce your child’s fever due to the increased risk of Reye’s syndrome (= acute encephalitis with liver failure). Give your child anything s/he likes, food that is easy to eat or digest. Make sure they drink adequate amounts of fluids (small amounts frequently). Your child shouldn’t attend school or nursery until at least 48 hours after their fever has dropped. This is to avoid infecting other children. Bronchitis, pneumonia and encephalitis are known complications. When your child has a severe cough, prolonged high fever, is not lucid or speaks nonsense, you should consult your doctor immediately. You should also consult your doctor if your child is not getting enough fluids, is lethargic or his/her urine output has decreased.